Friendship is the core of almost any journey — and it was true of my hike at Laity Lodge. I know that I already mentioned the hike in my post, Bluff, but it really is a three chapter story for which I only told the middle chapter. Chapter One — One mile hike up. Chapter Two — Pretty view. Chapter Three — One mile hike down. While I loved the view, I think I loved the hiking part more. Because of the friendship aspect. When we walk with someone, we learn something — about them and about ourselves. On the way up, I walked with Dawn — Dawn-of-a-thousand-careers, also known as Dawn-of-the-mutual-friends. Everyone has a thousand stories. As much as I love reading stories, I love hearing the stories. I love asking questions so I’m picturing it clearly in my mind. And hearing the rise and fall of the teller’s voice as they emphasize the words that are important in their telling of the story. I love seeing them smile when they tell the parts that make them smile, and bite their lip a little when they tell the parts that are hard. I loved hearing Dawn’s stories on the way up. One of her stories involved running a marathon (or was it a half-marathon?) where she completed it by sheer will-power. She’s a strong woman. What I learned about me while I was hiking with Dawn was that I don’t like to confess to my weaknesses. I was running out of breath, going what felt like straight up. 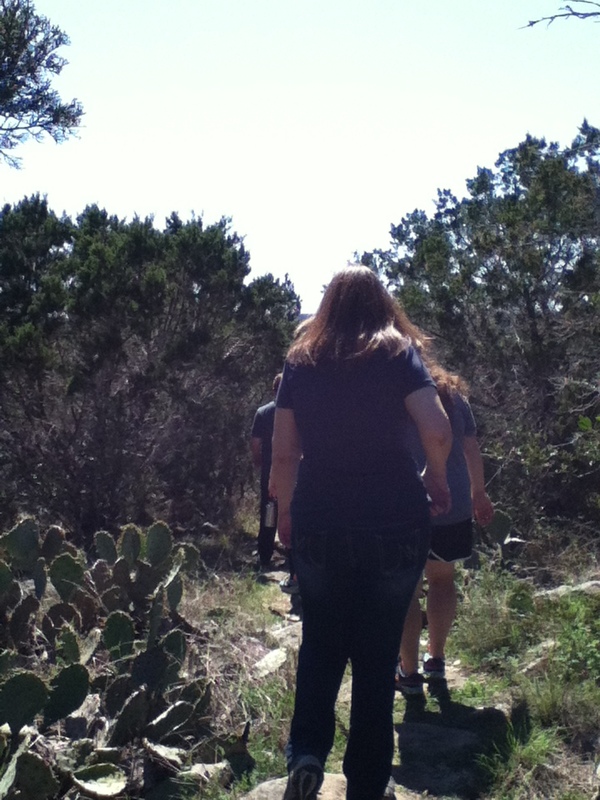 The gap between us and the next group of hikers grew larger and larger as we hiked slower and slower. Darned if I would admit needing to rest though! If Dawn could keep going, I could keep going. “I need to catch my breath,” she said. On the hike down (which was much easier) I walked with a young woman named Kristen. Tall, beautiful, and with an enviable openness about her — she told me about her work, her church, her family. It hit me as we were talking that she is the same age as Philip, my oldest son. I could be her mother, I whispered to myself, but the words flew away in the Texas wind. I marveled at the fact that I had arrived at the enviable stage of life where I have friends, real friends, that span many generations, and I’m right smack dab in the middle of them. It was a cosy feeling — not out of breath at all. A hike with friendship at its core. For me a hike almost seems better done in solitude, when it’s just me and the trail on my own terms. You’re right. I like that kind of hike too. I belong to a chorus which has members of all ages. I have loved cultivating friendships with both women younger and older than myself. It is such a blessing!